Art in Fernando do Noronha. So, you've been wondering how's Art in the Brazilian island of Fernando de Noronha? Get some insight information on Art in Noronha. The breathtaking landscape, unusual marine and wildlife blended with the tranquility at Fernando de Noronha, provides a perfect setting for artists to get their creative juices flowing, while most of the decorative themes of the inns and restaurants are inspired by local art. The art and handicraft found at Fernando de Noronha mirrors the styles present on the mainland, which draw heavily in technique and form from the cultural diversity of the Brazilian people and their European, African-American and Native Indian heritage. Bold colors are represented on various mediums including ceramic, wood, fabrics as well as materials local to Brazil, such as beans, banana trees and sisal. Embroidery and weaving are popular. The island has some shops and cafes which sell locally inspired souvenirs. The Café com Arte, located at Terminal Turistico do Cachorro, sells art pieces made by local artists and artisans, including some artifacts created from recycled items used at the café. Other souvenir and artisan stores include Companhia da Lua, Paraiso da Ilha, Santuario and Maezinha. A restored Air France building that was originally set up as a refurbishing and refueling base for hydroplanes, now houses the Noronha Association of Artists and Artisans, where one can observe local artists at work. The centre also offers beginners’ courses in art for children. The awe-inspiring scenery, marine life, beautiful sunsets, and wildlife make inspiring subjects for numerous professional photographers. João Paulo Barbosa for example, has captured the beauty of this island in timeless photographs, which sell as prints, while in his second “Over/Under” series, photographer and marine biologist Andre Seale encapsulates Fernando de Noronha in 124 breathtaking photos, divided into above water, under water and split level categories, with Portuguese and English captions. 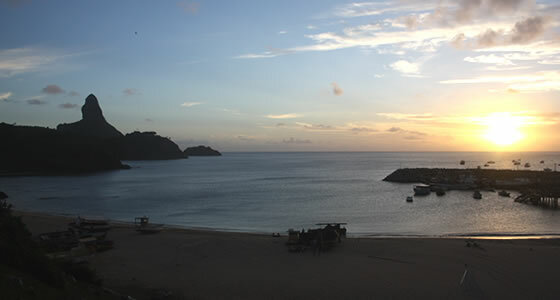 Fernando de Noronha has had a varied past, including Portuguese, Dutch and French occupation, as well as being used as a prison and military base at different times. The Memorial Noronhense - Espaço Cultural Américo Vespúcio museum provides visitors an insight into this diverse history. The construction of the Igreja de Nossa Senhora dos Remédios was begun in 1737 and completed in 1784. A visit to this church and the many fortresses (or their remains) built by the Portuguese in the 18th century, such as Nossa Senhora dos Remedios, Santo Antonio Fort and São José forts shed light on the architectural and decorative styles prevailing in this region during the mid 1700’s to the late 1800’s.